Trial of Russian ex-economy minister Ulyukayev to recommence on September 1 | Russian Legal Information Agency (RAPSI). MOSCOW, August 16 (RAPSI) – The Zamoskvorestky District Court of Moscow will resemble hearings in the criminal case against former Russia's Economy Minister Alexey Ulyukayev, who stands charged with extorting a $2 million bribe, on September 1, RAPSI correspondent reports from the courtroom on Wednesday. Earlier today, the court held the first hearing in the case. 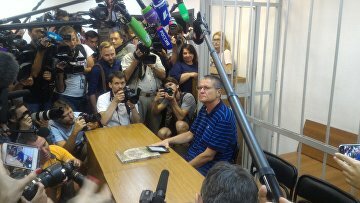 After prosecutor read the indictment, Ulyukayev claimed he is not guilty and stated that he believes the case to be fabricated. The defendant noted that there was a provocation, orchestrated by the Federal Security Service (FSB) and that there is no sound evidence in the case, aside from testimony of Russian oil giant Rosneft’s head Igor Sechin. During the hearing, Ulyukayev’s lawyers asked the court to return the case to prosecutors because indictment read by prosecutor was not consistent with the case documents. This motion was dismissed. Ulyukayev was arrested while receiving an alleged bribe in mid-November 2016. He allegedly demanded Russian state-controlled oil giant Rosneft’s representative to pay him $2 million for lawfully providing a positive review and evaluation of a deal that allowed Rosneft to acquire government’s share in mid-sized producer Bashneft. According to the Investigative Committee, the former minister threatened to create obtrusions for Rosneft with the use of his position. On November 15, 2016, the ex-minister was put under house arrest. Later in the evening, President Vladimir Putin relieved Ulyukayev of his post because of loss of trust. The Basmanny District Court has seized Ulyukayev’s property valued at over 564 million rubles (about $9.5 million). 11:41 16/08/2017 The Zamoskvorestky District Court of Moscow will resemble hearings in the criminal case against former Russia's Economy Minister Alexey Ulyukayev, who stands charged with extorting a $2 million bribe, on September 1.